No bracket will remain perfectly straight under even the lightest load. Even if a feather were placed on a 1/2” thick steel plate, the plate would be effected by the weight. The bending in this instance would, however, be too small to notice and the steel plate certainly wouldn't be in any danger of failing. 1) The bracket will be supporting the entire weight of the countertop. In most applications, the countertop is overhung, with the main body of granite being supported by a knee wall or cabinet. When this is the case, the rigidity of the granite provides extra support so that the bracket is only supporting a fraction of the overhung weight. 2) The bracket is ungusseted. A gusset adds significant strength to a bracket, but makes the calculations much more complex. This calculator is not a good indicator of the strength of a gusseted bracket. 3) The bracket has no holes in the top. Holes weaken the bracket slightly but this is nearly always a negligible difference. 1) The bracket is treated as a cantilevered beam. 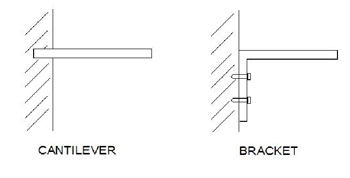 The difference between a bracket and a cantilevered beam is shown below. Because of this simplification, this calculator does not account for any bending that may take place on the vertical leg. 1) Material. 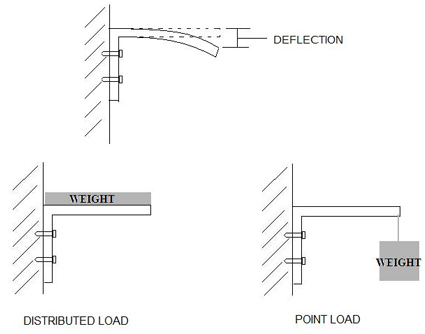 The type of plate material will impact the deflection due to differences in desities. 2) Load. This is the amount of weight the steel plate will be supporting. 3) Length. Length of the plate. 4) Width. Width of the steel plate. 5) Thickness. Thickness of the plate material. A thicker metal plate is much better at supporting heavier loads. 1) Distributed load. This is the value that is of concern in most applications. This is when the weight (entered in “Load” above) is spread out over the entire length of the bracket. 2) Point load at end. This assumes that all of the weight (entered in “Load” above) is at the very tip of the bracket. The equations used in deflection calculations are given below.